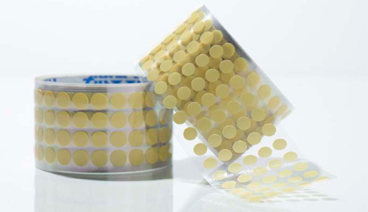 Our conformal coating discs are perfectly suited for precision masking needs, particularly in high volume conformal coating applications. These discs are manufactured from our CM300 conformal coating tape and are placed on a clear liner. Custom sizes are available. Discs must be removed the same day they are applied, due to the thermoset adhesive. If you cannot remove the discs right away, then an alternative is our CCD discs at the bottom of this page.